The folding MOTORINO™ LTf can go from “stowed-to-road” in only 15 seconds. 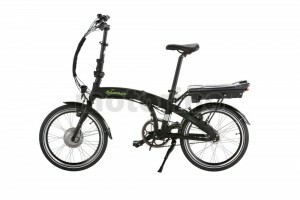 Incredibly compact but built for adults up to 6’ 2”, this 7-speed e-bicycle makes an ideal runabout for RVs, boats, planes, or even kept in the trunk as a hassle-free extension of your car. The easy-to-handle lightweight Lithium-Polymer battery pack can be removed in a blink and charged wherever convenient or swapped for a spare. The Motorino LTf features two power control modes: “power-assist” provides four user-selectable levels of assistance that are automatically engaged when the rider pedals, or there is “power on demand” delivered with just a twist of the throttle-grip. Mode and battery voltage are indicated by LEDs on the bar-mounted control panel. As with all other MOTORINO™ e-bicycles, the LTf is built with high quality components meeting European EN 15194 safety standards.